The time has come: time to own up to my high-spending, globe-trotting year. 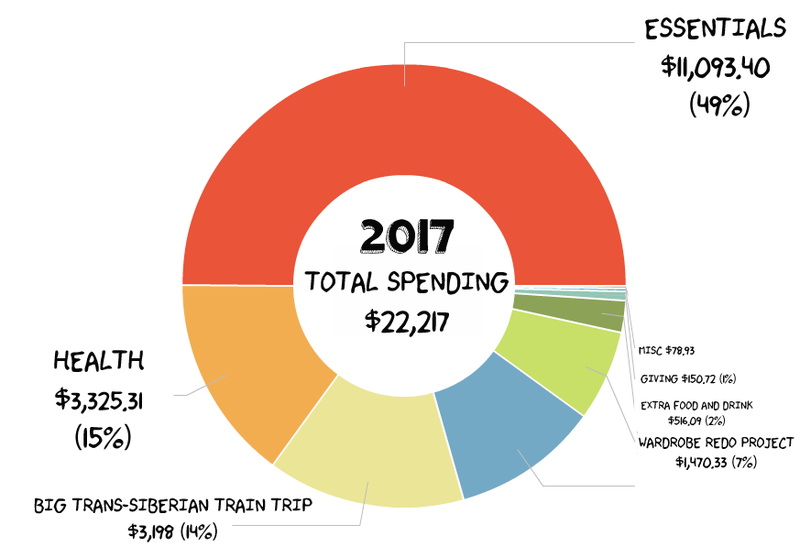 My goal for 2017 was to spend less than $20,000, which I did not accomplish – the total came in at $22,217, which is quite a bit over the goal. HOWEVER – based on my lower-than-predicted income for the 2017 year, I will be getting back ~$2,092 at tax time in health care premium subsidies, putting me within spitting distance of my goal (just $125 over). So, what did the expenses look like? This farm share subscription covers all of my vegetables from June – November, and I pay annually for one half share, saved in a sinking fund each month. This is for random treats that don’t get classified elsewhere. Mainly candy or things like chapstick. My timbuk2 bag I took on the Big Trip. Two times this year I hired someone to clean the apartment and split the cost- February and November. I’m very unhappy with this metric, especially when held up side-by-side with my clothing & travel expenses. Next year I hope to return to my previous 5-10% of spending levels. This just happens to be in its own category, I will not comment on what that says about the efficiency of its collection method. I have no good explanation for why this is so high this year. I had a clothing buying ban in 2016, so I spent nothing last year – except on fabric to make my annual Bowie costume. 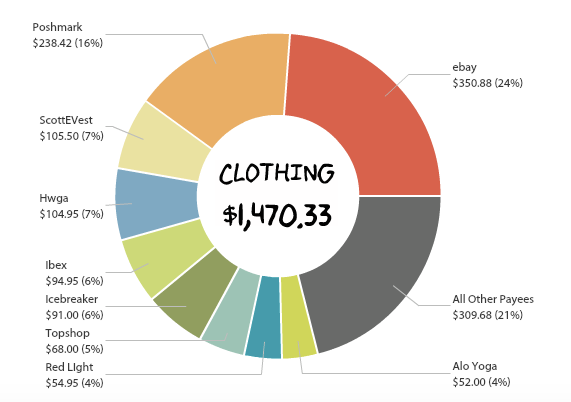 After I left my job and started a business, one day I just hated all my clothing, so I set a budget to redo my wardrobe. Many things I purchased were meant to be long-term investments in professional clothing. 85% of my purchases were used, most at half or less of the new retail price. However, I definitely don’t want to spend this much in 2018. *This may be adjusted upwards based on my final business expense & tax calculations for 2017. Some of this was “old money” left over from my substantial cash savings from back when I had a full-time job. I hope to put whatever tax refund I get directly in retirement savings to top off that number. 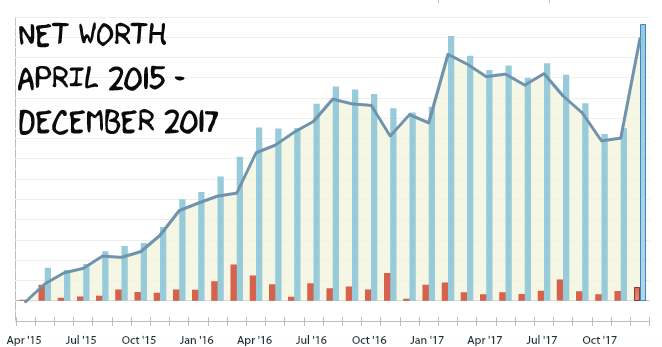 Thanks to some great market returns on my investments and a building a nest egg in my business account, I had a similar net worth change in real terms as I did in 2016 (last year it was +$8,769). So despite the lower income + savings rate, I did okay with building some wealth. Too high, overall, relative to my low income. I’m pretty much treading water here, month to month. Not outspending my income, but not saving a lot, and dipping into “old money” for my retirement savings. 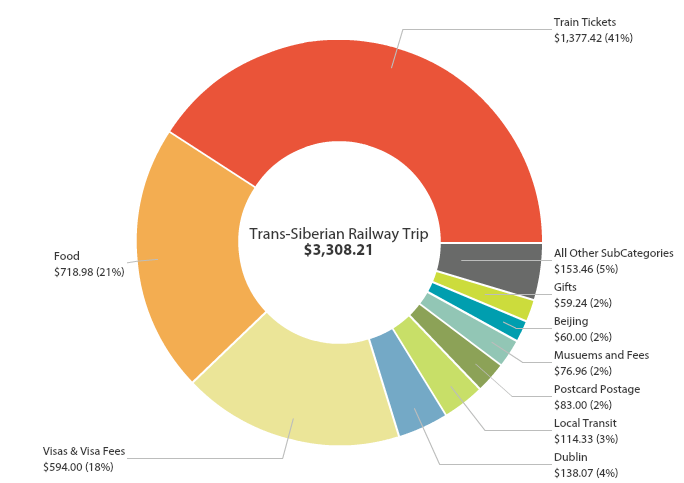 This year’s expense report show spending in accordance with my goals for the year (including big spending on a “bucket list” goal) and represents many of my values (bicycles, community, travel, health, style.) I think it’s really important to build up your budget to help plan for your goals, rather than having money be the biggest barrier to accomplishing your Big Goals. 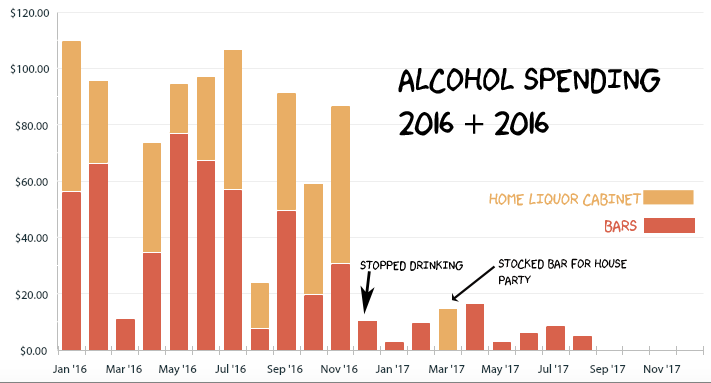 One really big win was quitting drinking entirely in late 2016 – this was kind of on a whim, with no plan for how long I would do it for. But I love not drinking, and it’s great for the budget, so it’s an indefinite timeline decision for the moment. But using my 2015 + 2016 spending averages on bars and alcohol for home, I’ve saved $814.45 in the past 13 months by not drinking. Yes, that’s $0 since August. The odd bar spending is for sparkling water. Not spending money on drinking alcohol or eating out often this year was definitely a factor in being able to travel to 15 countries, host a multi-city transit scavenger hunt for my birthday party, and focus on building my business, and my budget supported those goals. This year also shows that charitable giving doesn’t happen by accident to me, especially now that I’m not a professional nonprofit fundraiser (surrounded by other fundraisers), and I must plan for giving. While I’ve been contributing a lot of volunteer labor (Harry Potter Alliance board, Stream PDX organizing, Oh My Dollar! community classes), I am not happy with my financial giving this year, and look forward to next year being a bigger giving year. What is not included in my overall expenses above? Business travel costs – when a trip is a business trip, I pay from my business account. Taxes – I pay these before I cut myself a paycheck. All Electronics – the usual random amount of SD cards and external hard drives, plus a possible computer replacement (fingers crossed I don’t need it), these are of course business expenses.